Heat oven to 425°F. Place pie crust in 9-inch glass pie plate as directed on box for One-Crust Filled Pie. In large bowl, beat filling ingredients with electric mixer on medium speed until smooth. Pour into crust-lined pan. Bake 10 minutes. Meanwhile, in small bowl, mix 1/4 cup brown sugar, the chopped walnuts and flour; cut in butter until crumbly. Set aside. Reduce oven temperature to 350°F. Sprinkle streusel over pie. Cover crust edge with 3-inch-wide strips of foil to prevent excessive browning. Bake 30 to 35 minutes longer or until knife inserted 1 inch from edge comes out clean. Cool completely, about 2 hours. Serve or refrigerate until serving time. To serve, in medium bowl, beat whipping cream and 2 tablespoons brown sugar with electric mixer on medium-high speed until soft peaks form. Serve pie with whipped cream; garnish with chopped walnuts. Store in refrigerator. 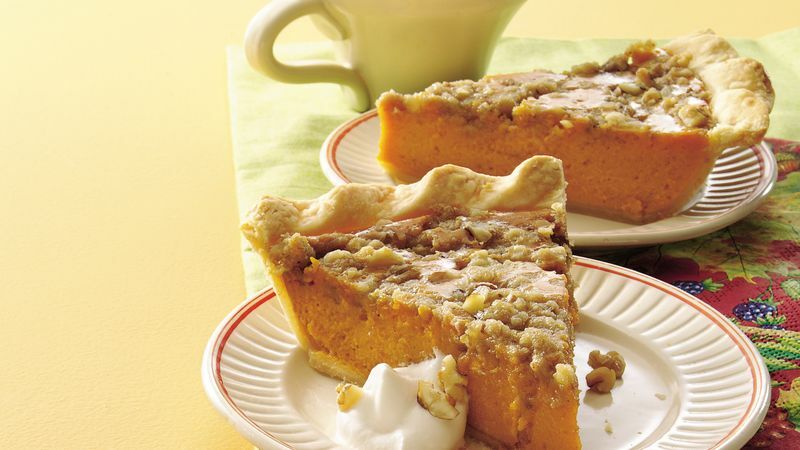 For this recipe, purchase plain pumpkin, not pumpkin pie mix, which includes seasonings.